Want to shape the future of women's rugby? This one of maybe just for the older players, or come to that parents and coaches, but as the advert has no minimum age... Basically the RFUW are looking for new Directors for the Board that runs the game - so its pretty important, and you get all travel expenses paid. The RFUW seem to to advertise these Director posts every three or four years, and it has to be said that in the past some followers of the game have been given to ponder the question of how genuinely open the process was, but in the end you have to believe that they are genuine about their desire to see some new faces running the women's game. Applications need to be in by 19th February, and if you are interested you need to drop a line to susanallen@rfu.com. On the face of it, a Special Award from the Rugby Union Writers Club to Cath Spencer (right) the captain of the England Women's team should be seen as a important event. Not only richy deserved for both Cath and her team, but coming from a group that has, until now, bent over backwards to avoid giving any recognition to the game it should be a major breakthrough. Should be - because this is where things get quite strange. Because a couple of weeks ago Cath received her award at a dinner organised by the RUWC, alongside two other (needless to say male) players. It was a great evening, and Cath said all the right things, such as “The honour was great for me as an individual and for England as a team, but it was brilliant for the women’s game to be given that profile at such a prestigious ceremony”. But when it came to publicising this event, guess what the writers did? Yes - they ignored Cath's award pretty much completely - in fact only one report (that I can trace) mentioning Cath appeared, on the women's news section of the Six Nations website. Very odd. It seems that the country's rugby writers do recognise women's rugby and the success and ability of the England team in private... but dare not be seen to support it in public! What are they frightened of? The 2010 Women's Six Nations was officially "launched" at a press conference this afternoon in London. As Scrumqueens reports, the launch was alongside that of the men's tournament with (possibly for the first time) representatives from all six teams present. Unfortunately disappointingly (but not, perhaps, surprisingly) other reports also say that the women's launch was "an afterthought" with few (if any) of the journalists present being made aware of the women's competition, or who the women's representatives were - a situation not exactly helped by the fact apparently none of the press briefings gave any details about the games in the women's tournament. So, for the record, the Women's Six Nations kicks off a week on Friday - a day before the men's tournament - when Ireland take on Italy at Ashbourne, scene of their incredible win over France last season. In fact all of Ireland's home games will be Friday evening matches at Ashbourne. Wales and England also have a single "home" for this season's competition - Bridgend and Esher respectively - and the match of the weekend in the opening round will be the meeting of these two teams at Esher on Saturday. First and second last year, England will also be looking for revenge following Wales' win in the tournament last season. Finally France will be travelling to Scotland. A complete list of this season's fixtures can be found here. Slightly gob-smacking news today that BBC Northern Ireland plan to not only carry a report on the story I dug up recently about the "first girl to play rugby" (Emily Valentine, pictured on the right - amazingly her family have even uncovered a picture of her! ), but they are even planning a dramatic reconstruction! I gather that not only did they like the story (as did The Times, the RFU Museum, and the Irish RFU), but they are planning to interview her surviving grand-daughters (even though they do not live in Ireland anymore), as well as visiting the school, and have even put together some detailed plans to "reconstruct" her try-scoring school debut (in appropriate sepia tones), as featured in her memoires. No idea when this will be broadcast, or if it will be shown outside Northern Ireland (but the way things are going I would not be remotely surprised), but its all a bit astonishing - as well as being potentially a great bit of publicity for girls rugby generally! As last year, the OA Saints are going to host another couple of training sessions for the local Hertfordshire under 18 players who are moving up to Senior Rugby in September. This worked very well last year and allowed them to introduce themselves and train together to give the girls an informed choice about where they wish to play their senior rugby. Naturally, parents and coaches are very welcome and there will be plenty of beer in the bar afterwards! The girls matches at Letchworth today were to be the Thames Valley league fixtures against Oxfordshire for both U15 and U18 Letchworth Saracens teams. However, Oxfordshire U18s were unable to field a side so while the U15s got to grips with their opponents, the U18s got down to some serious training. The U15s match got off to great start for the home side when Emily ran almost the length of the pitch before passing to CJ to open the scoring and that was followed by a period of concerted Letchworth pressure which looked certain to result in another score. However, a turnover right in front of the Oxfordshire posts led to a super breakaway try for the visitors which levelled the score. This put a brief stutter into the Letchworth Saracens play but they were soon on the attack again and were rewarded with a string of 2 tries by Ellah and one by CJ to take them to the break deservedly leading by 22-5. The second half began like the first with Letchworth Saracens pressing the Oxforshire try line and Emily converting the pressure into a try. However, the rest of the match was an Oxfordshire resurgence against a tiring Letchworth Saracens team who, despite some very determined defence, were pressed back to their own try line several times. Oxforshire were rewarded with a pair of well deserved tries and were in the ascendancy right to the end but the home side held on to win by 27-15. The Letchworth Saracens U18 and U15 matches against Oxfordshire next Sunday will be played at Letchworth rather than at Saracens as was originally intended. Will all players please meet at the Letchworth club by 12.30pm at the latest. USA and Canada's national teams have battled themselves to standstill in Florida this week. After it looked like the Canadians had brought the weather with them earlier in the week, the weather cleared up in time for the first test which the Canadians won, coming back from 8-0 deficit at half time to win 18-8 (see this video report). Yesterday saw two more games, an U20 international being followed by the second test between the senior teams. Both games were breathtakingly close, the Canadians sneaking in 13-12 in the age group game with a try in the dying minutes, but USA gained revenge 11-10 win in the adult fixture after Canada had missed a conversion at the final whistle. The series was organised to set the two sides up for the World Cup - and continues to show that you cannot get a tissue paper between the two of them. This guarantees exciting games whenever the two play, but the inability of either side to finally breakaway from their continental rivals probably does not bode well for either nation when the main tournament comes round in seven month's time. They are both great sides - but not exceptional. Of the two, though, Canada probably finished the more satisfied as their near-catastrophic dip in performance last summer has now been arrested and turned round - but that may be at the expense of a discipline problem. They picked up three yellow-cards yesterday to add to another at what could have been a crucial stage on Wednesday - that is a quarter of the series played with only 14 players. They cannot afford to do that in August. This is also the third series running where Canada have started well in their first game, but failed to keep the momentum going through the series. And their biggest pool game in Guildford - practically a quarter-final - will be their third fixture of the tournament. USA, on the other hand, seem to improve with match practice - but they are in England's group, so their realistic hope for progress will be as best runner-up and will be dependent on what happens elsewhere. 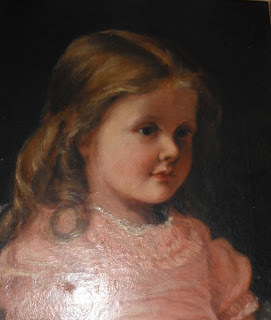 Last week I said that I had uncovered a few facts about possibly the first girl to play rugby. Well, now it is possible to reveal her full story - including a description of her first game, in her own words. It reads like something by E Nesbit, but it is all true. I loved rugby football, but seldom got a chance to do more that kick a place kick or drop goal, but I could run in spite of petticoats and thick undergarments, I could run. My great ambition was to play in a real rugby game and score a try. I used to stand on the touchline in the cold damp Enniskillen winter, watching every moment of play, furious when my side muffed a ball, or went offside, bitterly disappointed when a goal was missed. One day I got a chance. It was just a school scratch match and they were one "man" short. I was about ten years old. I plagued them to let me play, "Oh, all right. Come on then." Off went my overcoat and hat - I always wore boys' boots anyhow, so that was all right. I knew the rules. At last my chance came. I got the ball - I can still feel the damp leather and the smell of it, and see the tag of lacing at the opening. I grasped it and ran dodging and darting, but I was so keen to score that try that I did not pass it, perhaps when I should; I still raced on, I could see the boy coming toward me; I dodged, yes I could and breathless, with my heart pumping, my knees shaking, I ran. Yes, I had done it; one last spurt and I touched down, right on the line. I lay flat on my face for a for a moment everything went black. I scrambled up, gave a hasty rubdown to my knees. A ragged cheer went up from the spectators. I grinned at my brothers. It was all I hoped for. I knew I couldn't kick a goal, but that didn't worry or disappoint me; what I had wanted to do I had; the desperate run, the successful dodging, and the touchdown. On the way home, muddy and hot. "You didn't do badly, Em, but you should have..." and so on. Later on at tea my brothers grinned at me, passed me the jam politely, and kicked me under the table. My mother remarked that she hoped I hadn't felt cold watching the game. "I'm glad you won the match boys, " she said . My brother raised his cup, looked at me, and drank then winked. "Good luck, wasn't it mum?" So there it is. The first recorded mention of any girl playing rugby, probably anywhere in the world (well, so far as anyone has found). Emily went on to become a nurse, marrying a military doctor - William "Ricky" Galwey - in 1909, before going with him to India until about 1915. She had two children, and now has a dozen or more descendents across Britain and beyond. She died in 1967. The rising popularity of Sevens is producing ever more new tournaments, and the latest group to set-up a sevens series are promising that there will be a women's event at all their tournaments. 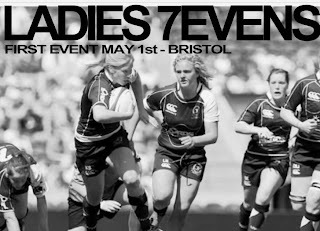 www.7evens.co.uk are launching themselves with an event at Bristol on 1st May and are also planning another tournament in Leeds. Three years ago there was only one women's club sevens - the RFUW tournament - but this spring and summer there will be at least five! This is clearly a great time for the women's game - there is no reason at all to stop playing after you are 18. Its also interesting that it is the commercial world that is providing all these new playing opportunities for women's clubs. Clearly they have seen an expanding game even if others (like the BBC, below) have not! Does this mean that the BBC will change their attitude? Possibly not - but undoubtedly the fact that someone has had to go to the trouble to write a letter of this length will have had some effect and its a fair bet that if their news or sports department had to write 20-30 letter like this every time they ignored a similar women's rugby story they soon would change their minds. I cannot say that I am entirely happy with the result (the BBC don't discriminate against women's sport? Clearly this was not written by someone with any knowledge of the BBC Sports Personality Team award last year!) but at least a few cages have been rattled. Let's see if they get it right next time. Thanks for your further e-mail regarding the BBC News. Firstly, I should apologise for the delay in getting back to you. We realise that our correspondents appreciate a quick response and I'm therefore sorry that you've had to wait on this occasion. I understand that you weren't happy with the first response to your complaint. The Sport News production team have seen your complaint and will take your concerns on board. To address these concerns, there was no deliberate attempt to overlook the women's rugby team win. It was an exceptionally busy day of sport and in the network bulletins we only have a strictly limited amount of time devoted to both match reports and results. Each story is judged on it's merits. The women's result in terms of audience interest simply wasn't of greater significance than the sports featured in our summary. Had we had more time allocated to the sports desk it may have been possible but it would not have replaced any of the existing stories/results. truth. The achievements of both the women's football and cricket teams have been featured on numerous occasions and sports women as diverse as Rebecca Addlington, Christine Ohorugu, Victoria Pendleton, Beth Tweddle, Laura Robson and Jessica Ennis have all featured on news bulletins over the past year or so. I can assure you that we have nothing against women's sport and are always keen to celebrate achievement - but news judgement is a subjective business and it's not always possible to include as much as we'd like, given the time constraints. Thanks again for taking the time to contact us with your feedback. With the postponement of the regional trials which were due to take place on Sunday, we are holding a Letchworth Saracens training session at the Saracens ground. Please meet at Letchworth club by 11.45am to travel to Saracens for 12.30pm. If you are travelling direct to Saracens, please let Wonky or Mike know. Letchworth girls are a hardy lot which is just as well because tonight they had their first training session of 2010 on the verdant lawn that is our training pitch ... well, not quite! Although the pitch still has a covering of 5-10cm of soft snow, what it is covering is no longer the hard ice that has prevented training since December ... now the snow is covering a layer of water over our usual bottomless depths of brown sticky mud. To say that the pitch now 'takes a stud' is to hopelessly understate the case - it also takes a whole foot not to mention the attached flipper. At just one degree above freezing with a thick mist over the grounds, these conditions were not for the faint-hearted. Nomads v Wales and regional trials called off. Sounds like the snow has melted and Bramley Road resembles a muddy swimming pool again, so Saturday's international has officially been cancelled. The same problem has also resulted in the postponement of this weekend's regional trials. These will how take place on 31st January. More information (like where) will be published at http://www.regionalrugby.com. Wonky will be conducting our first training session of 2010 starting at 6pm tonight. Given the snowy/frozen/flooded nature of the grounds we may well be indoors - so please bring indoor footwear as well as boots. Our "other" home ground will be hosting a women's "international" next Saturday. Nomads - the "Women's Barbarians" - will be taking on last year's Triple Crown winners Wales, kicking off at 1pm (weather permitting). The Welsh team has yet to be announced - but should be pretty close to full strength, while Nomads will field a full team of UK-based international players. If you can try to get down to Saracens next Saturday - it will be well worth it! As anticipated last weekend, the weather has gone from bad to worse this week and, consequently, both Thursday training and our friendly match on Sunday have been cancelled due to the frozen pitches. Hopefully, we will be back in training in Thursday 14th at 6pm. I imagine that most of you will know about the "legend" of the invention of rugby by a boy at Rugby School called William Webb Ellis back in the 1820s. Its all a bit of a myth, but I've unearthed (or, in all honesty, am in the process of unearthing) a remarkable story of what may be the female equivalent - possibly the first girl to play rugby. Its a bit difficult to say when rugby, as a sport, began. Rugby School's rules were first published in the 1840s, but they were obviously playing the game for years before that. However it wasn't until 1871 that the RFU was formed as the game's first "governing body" so arguably it is only from then that the game exists as a separate sport. But only 13 years later in September 1884 a teenage girl - Miss E F Valentine (don't have her full name yet), along with her brothers, wanted to play rugby at her school. Her school - Portora Royal School in Enniskillen, Northern Ireland - were not very supportive and refused access to the main sports field, but this did not stop them. They seemed to have persuaded others to join them and started by playing amongst themselves every Saturday, not least because there were few teams for them to play - though some records suggest that they did play some fixtures in 1885. Thanks to their efforts by 1887 the game had been accepted and the school was playing regular fixtures - as it does to this day (it celebrated 125 years of rugby last year, though Miss Valentine seemed to be forgotten). Its an amazing story because this is 1884 - Victorian Britain - not a time when well brought-up young girls would have normally been seen doing anything particularly energetic or sporting. If we think that prejudice against women is sport is bad now it is nothing compared to what it would have been like then. She was clearly a remarkable young woman - and her story probably deserves to be better known. The frozen ground at both Saracens and Letchworth clubs have left us with no choice but to cancel training tomorrow. 2010 is going to be an important year for women's and girls' rugby. The World Cup and (perhaps in the long run just as important) the merger with the RFU could take the game to a whole new level, perhaps making the sort of breakthrough that women's football and cricket have achieved in recent years following similar on-field success and off-field reorganisation. However, one woman has - largely unnoticed - achieved a remarkable breakthrough that would be impossible to imagine in either of the other two sports. Because Elaine Vassie, seven years after taking up the game and only four years after becoming a coach, is now the Head Coach of semi-professional side Manchester RFC in National League One (only two steps below the Guinness Premiership, and three above Letchworth's 1st XV). Admittedly it is not the post she joined the club for. As an article in today's Daily Mail reveals she originally joined the club as an assistant coach, with an emphasis on conditioning. But when she arrived she found that most of the 1st XV had left due to money problems, with the Head Coach following a few weeks later. With almost no experienced (or even adult) players life for Manchester has been pretty difficult, but Elaine seems to have held her team together remarkably well and - while they are still without a win - they aren't losing by margins of over 140 points any more. Though relegation for Manchester this season looks certain (and has done since before Elaine took over), if she can hold her young team they could be a team to watch in the future.